While cleaning, make sure you pass the vacuum cleaner over a spot several times. Passing it once may not be enough to clean off hair or pet fur from the floor. Go over your floor multiple times and from different directions to ensure most of the particles are cleared. Most people assume that vacuuming a house once in maybe a month is enough. However, to avoid dust particles and other debris accumulating, it is advisable to vacuum your house as often as you can. You can create a schedule to help you remember and to ensure your floor is always clean. This may seem as a tip one should know already, but most people do not know how they can make it easier. This can be done by ensuring dust particles and hair are not spread out all over the floor. For instance, if you allow shoes in the house, you can have mats on entryways or have one spot where pets sleep to ensure debris are concentrated on one spot and not all over the house. Whether you own a bagless or bagged vacuum cleaner, ensure you empty it to avoid clogging of the hose. Vacuuming a house with an already full bag can be hard and very frustrating. Ensure you empty the bag whenever it gets three-quarter full for efficient cleaning. A vacuum cleaner helps to remove dust particles and other debris on your floor in your bedroom, however, it does not remove stains on your carpet. To ensure your house is always clean, treat spots as soon as you note them. If you spot them while vacuuming, treat them first with a spot remover then finish vacuuming later. Before you start vacuuming the house, make sure you pick items, such as toys, food particles or any other visible item on the floor. This will make vacuuming easier and prevent blocking and breaking the vacuum cleaner. There are a variety of vacuum cleaners in the market with different settings to clean different type of surfaces. Make sure you understand how your vacuum cleaner works and are able to put the right setting for the surface that you are cleaning. When you are cleaning your house, it is advisable to dust other places first before vacuuming the floor. 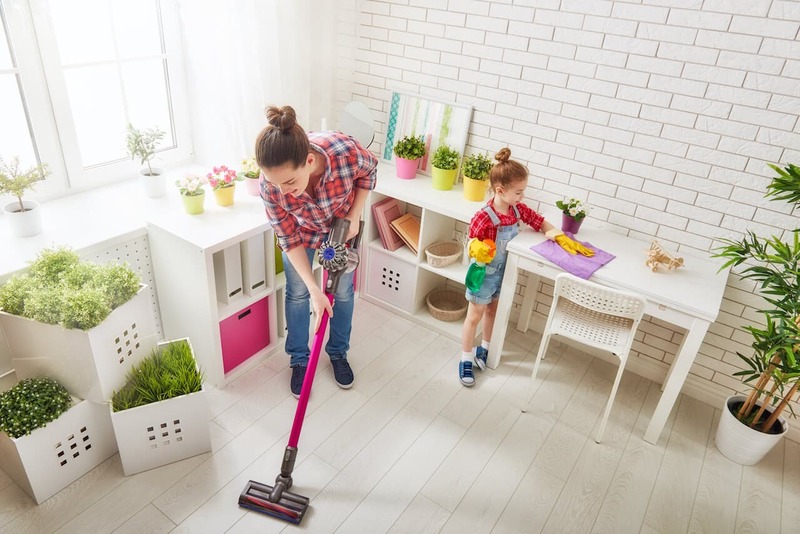 This is because while you are dusting, particles will fall on the floor while others will be stirred around the house. While vacuuming the floor after cleaning, you are able to capture the dust particles in the air. Depending on the model of a vacuum cleaner that you are using, some vacuum cleaners may get stuck on the edges of a rug. This may either damage the vacuum cleaner or cause the rug to fray. Ensure you have the right setting while cleaning the rug and pay attention to ensure the cleaner is not stuck. While doing your normal cleaning, it may be hard to move furniture and vacuum unreachable spaces in the house. Consider having a deep clean once in a while so that you can have a thorough cleaning. This includes shampooing the carpet, disinfecting counter tops, spot cleaning just to mention a few. This will help to remove stubborn debris and leave your house clean always after vacuuming. Vacuuming cleaning is important for every house, however, it is not an easy task. Apart from acquiring a vacuum cleaner, one also need to create time for the cleaning. With busy schedules and other business to attend to, vacuum cleaning may be tiresome. However, there are cleaning services available for hire such as Calibre Cleaning in Melbourne. We aim to help you clean your house to perfection each and every time!